Last year I started on a little project to keep track of what and how many movies I watch a year. 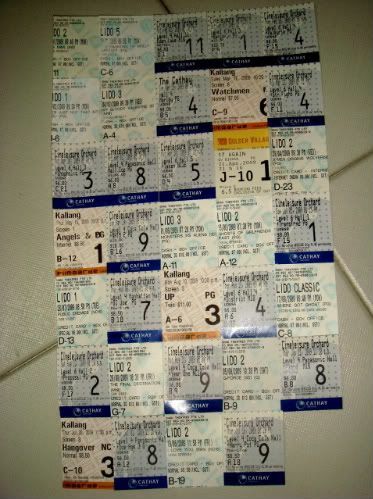 The Cathay tickets are the best, cause 5 of them in a row is the width of one A4 piece of paper. 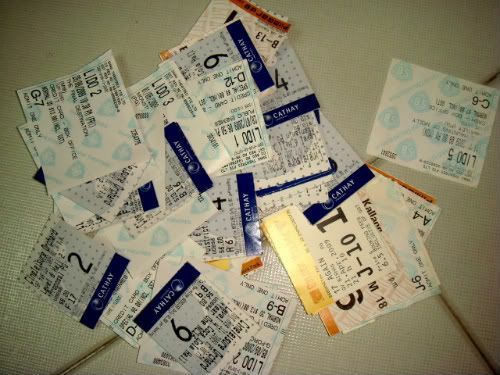 So basically my aim was to watch one A4-piece-worth of movies, which basically means 30 ticket stubs. I've no idea what advantageous result I get from this (other than knowing the extension of my contribution to the box office) but it was just interesting. 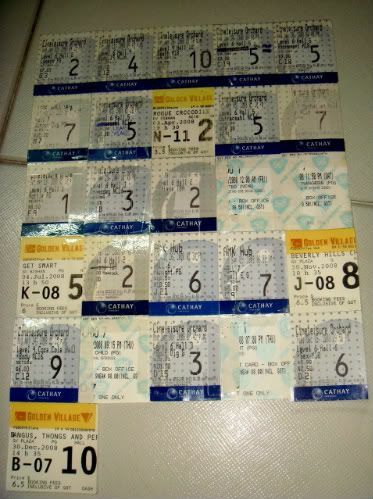 26 movies! Just 4 ticket stubs shy of A4. 34 movies and it's still September! My stubs were entirely in chronological order till I found another 5 tickets in my drawer naturally after I was done, so that's that for orderliness. Oh well anyway the printing on ticket stubs is really bad. The Cathay has the longest-lasting printing, the best size and the best thickness (unlike the flimsy nonsense from Shaw). Okay you just wasted 5 minutes of your time learning about all that.